In the last couple of blogs, I’ve been talking about triad substitution and chord substitution. In this blog post, I’d like to talk about the king of substitutions – The tritone substitution. The purpose of a tritone substitution is to create an augmented and diminished pull towards a chord a 4th up, stronger than you would by just moving to it. Most of the time this happens from chord I to chord IV, but you can find it in other places as well. As you might know, in a Blues we often turn the I chord into a dom7. This breaks away from the major scale’s I chord which has a natural extension of maj7. The D chord (chord IV) has the notes of D – F# – A. The G pull more towards the F# than the G# does as it is now only a semitone away. A7#5: A – C# – E# – G.
The E# (that’s an F) want to move towards the F# stronger than the original E, again, because it’s now only a semitone away. A7b9: A – C# – E – G – Bb. The Bb wants to go to the A as it’s only a semitone away. You could also try #9 and b5, all these are augmented and diminished notes and create a similar, altered, sound. Instead of building chords like A7#5, A7b9, A7b5, A7#9 or even A7b5b9 etc you can tritone substitute. A tritone is a #4 or a b5 (same thing). From an A this is the note D#. If we take the note D# and play a dom7 chord, ie D#7 we have tritone substituted. In relation to A, these notes are D# (b5) G (b7) A# (b9) C# (3). We get the same pulling effect using this method as we would extending our A chord to A7#5, A7b9 or any of the other slightly bonkers sounding combinations. When soloing, if you want this ‘outside sound’ the augmented/diminished notes have, you could instead of learning those arpeggios just tritone substitute. Try it by playing a lick over A, using Mixolydian or Major Pentatonic, then just before you move to the D chord, add the arpeggio of D#7. Here’s some TAB indicating how this could be done, first with the chords there, then without. Here’s the same idea, now without the leading tritone substituted chords. You can do this with chords but also when you play a solo. 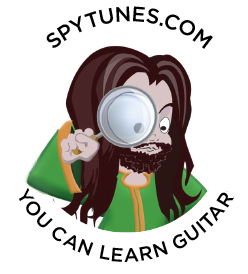 For more about music theory, learning arpeggios and scales, sign up for my step by step guitar courses.